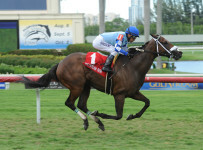 Conditions are Fast and Firm for today’s Florida Derby Day card at Gulfstream Park. 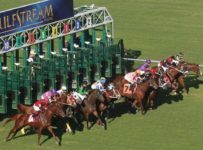 In addition to its headline race, Gulfstream will have a mandatory Rainbow 6 payout of a pool that likely will be between $10 million and $15 million. For coverage this afternoon and evening, please turn to our blog which can be accessed on the menu bar at the top of the home of this Web site. The $1 million Florida Derby (Grade 1) is the 14th and final race, with scheduled post of 6:36 p.m. It is 1 1/8 miles on dirt for 3-year-olds and is a qualifying points race for this year’s Kentucky Derby to be run May 4 at Churchill Downs in Louisville, Ky.
We will post our predictions and recommended bets at approximately 5:15 Eastern Time. We are picking Bourbon War to win the Florida Derby, and we recommend considering longshot Garter and Tie for lower spots in exacta and trifecta bets. The mandatory payout Rainbow 6 is on races nine to 14, with the sequence set to start at 3:34 p.m.
Gulfstream will pay out the “jackpot” of the entire incoming carryover of $2,660,030 and 80 percent of today’s new Rainbow 6 bets—regardless of the number of tickets with the winners of all six Rainbow 6 races. On non-mandatory days, Gulfstream pays out the jackpot only when there is just one ticket with all six winners. Gulfstream officials have said they expect more than $10 million to be bet on the Rainbow 6. It is a 20-cent per combination bet, with multiple horses permitted in each race. For example, a bet with two horses in each race has 64 combinations and costs $12.80.